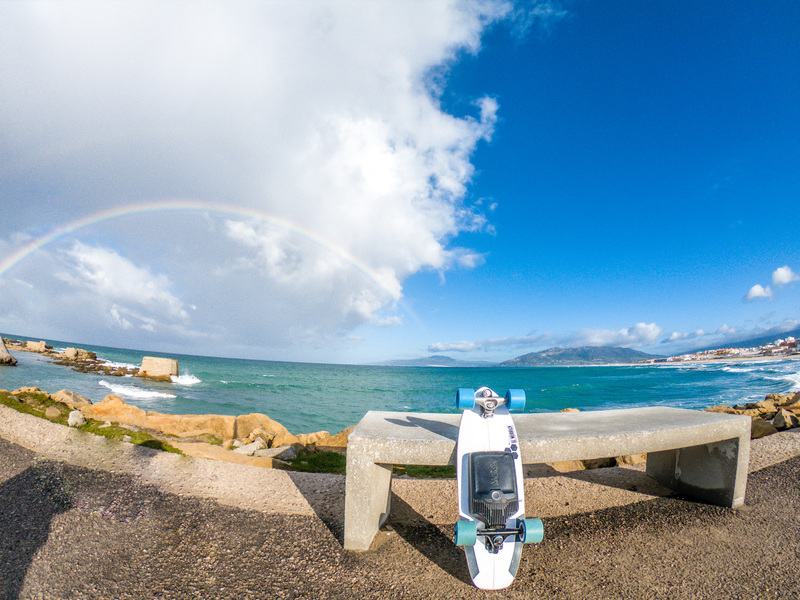 09:00 am: The day in Tarifa started with a decent cruise with the Carver skateboard with Mellow electric drive through the old town, followed by an extensive breakfast. 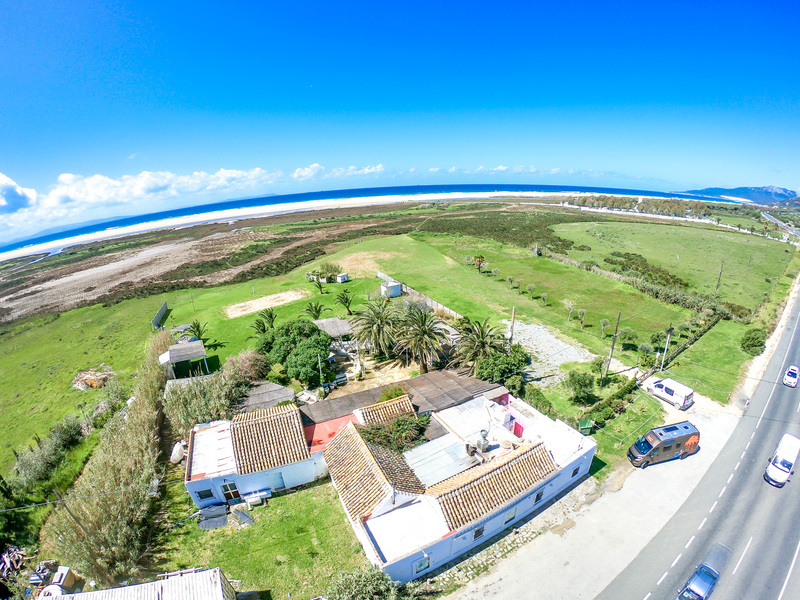 10:00 am: The meeting marathon begins, Nasser is also on site, he is responsible for the kite lessons for KiteWorldWide in Tarifa and Essaouira. He came to Tarifa to see two new projects. One project is planned for this season, the other is something more long-term. 02:00 pm: Finally the sun is shining and in the afternoon there is also wind. Top! 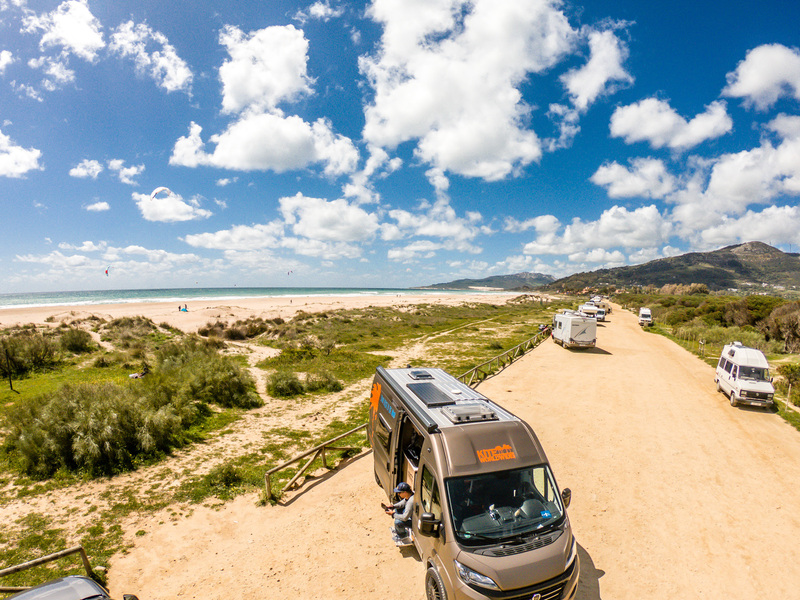 The KiteWorldWide Van is still at the Balneario. Since it is low season, you can also kite here. So wetsuit on, kite inflated and off you go. The 9 fits, the waves too. 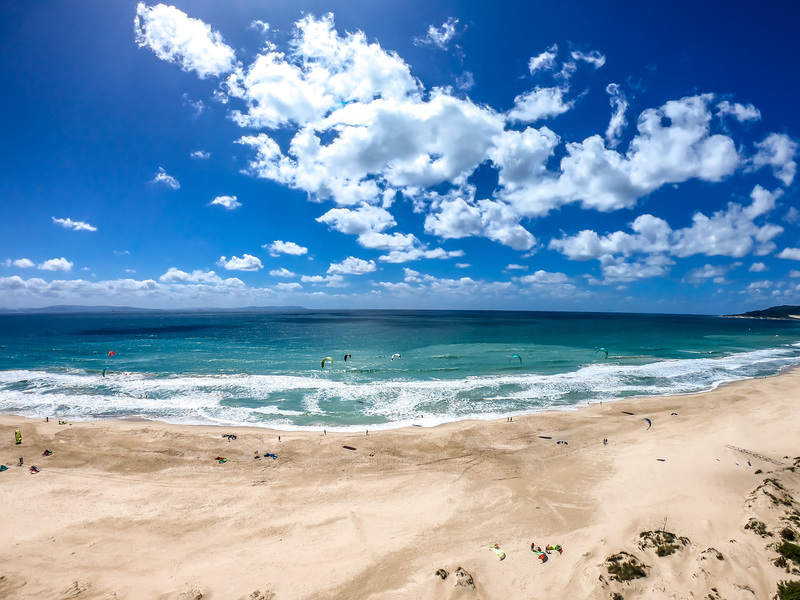 Tarifa just rocks it every time, no matter how often you come here. 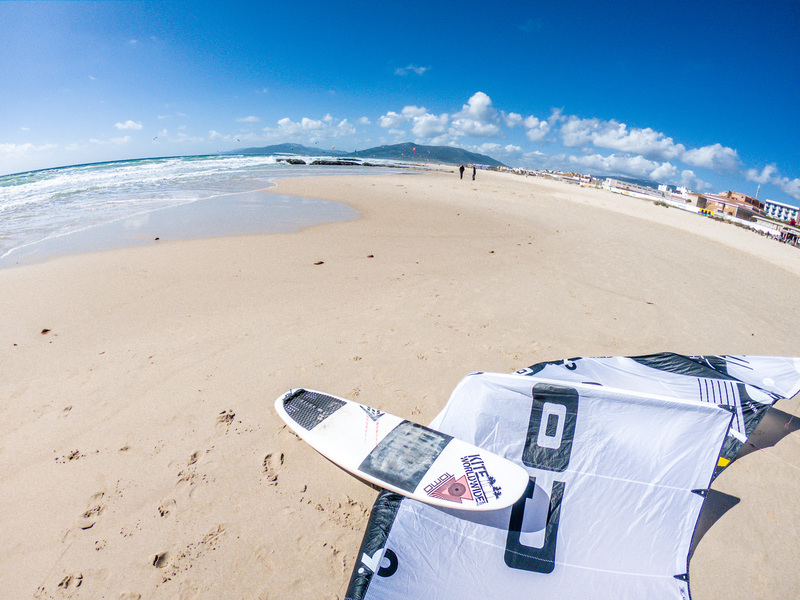 For all information about kitesurfing on the waveboard have a look at the Strapless Kitesurfing Tutorial. 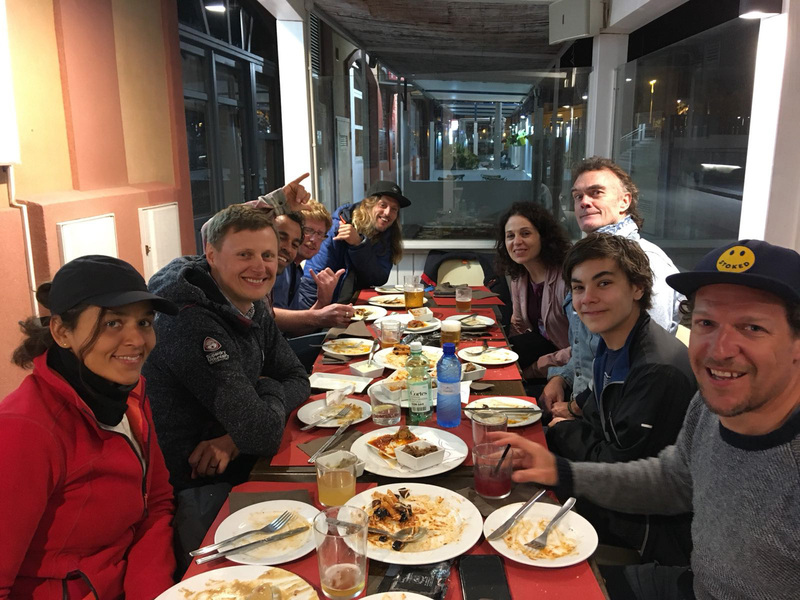 8:00 pm: In the evening tapas with the KiteWorldWide guests and the team. Gabri, the station manager is also there. Also KiteWorldWide Guide Mike and kite instructor Alex. The food was so delicious that we only remembered at the end that we could take a picture. The round of mojitos in Targa’s old town is not to be missed. 09:30 am: Next morning breakfast at the Wet Café at the entrance to Los Lances beach. The Eggs Benedict with salmon are always a hit. 10:00 am: 100 meters further on Gabri is already waiting, who has come up with something cool. The former Best Pro Center is empty and Gabri has secured the two small “market stalls” for the season. So this is the old / new KiteWorldWide meeting point, just a few minutes walk from the beach. Quickly created a list of requirements and placed a large order of beanbags to Hamburg. 12:00 pm: Back in the van and off to the “runway”. This is a long, wide sandy path parallel to the beach. Here you can also stay for a few nights in the low season. So you have the kitespot right in front of the door. 02:00 pm: Gabri meets here with the students for the beginners course. The light, steady wind (it is Poniente, so west wind coming from the sea) makes it easy. The sun is shining, the wind is blowing, time for a few droneshots from the mile-long sandy beach with the Gopro Karma. 05:00 pm: The students practice with 9 kites on the beach, Jürgen prefers to set up a 11. It’s cool to end such a working day with a kite session. 06:oo pm: Gabri stays after the course for a Tinto de Verano at the beach bar. 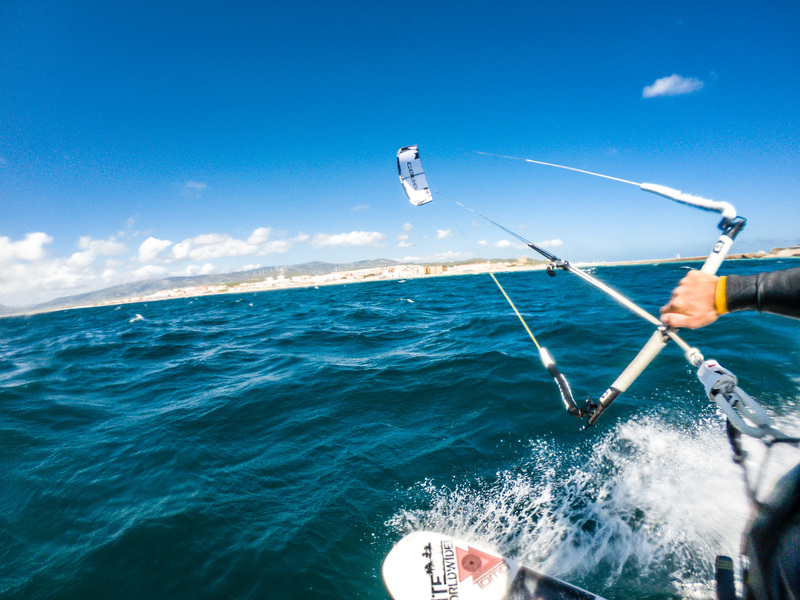 Tarifa is always worth a (kite) trip. 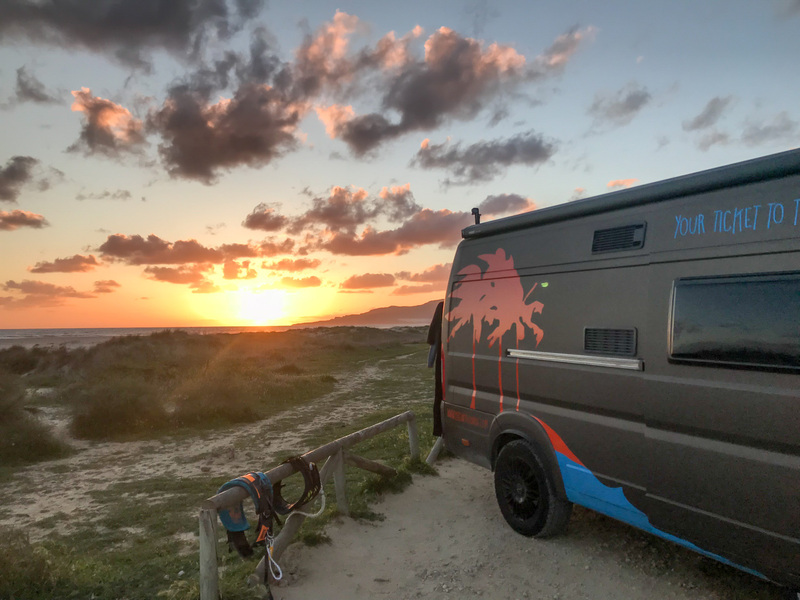 The highlight is the sunset in front of the dunes of Bolonia and the quiet sound of the sea to fall asleep. Good night!